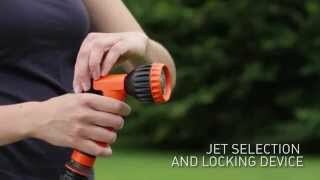 Shower pistol with ergonomic handle grip, ideal for watering flower beds and potted plants with a light, gentle and uniform rain effect. Sturdy, easy and comfortable to handle, it allows you to adjust the water jet at any moment and to lock the position of the adjustment lever with the specific mechanism, thus preventing hand fatigue, especially in the event of prolonged use. Pieces per pack: 9 pcs. Pieces per pallet: 648 pcs.